The pipits are a cosmopolitan genus, Anthus, of small passerine birds with medium to long tails. Along with the wagtails and longclaws, the pipits make up the family Motacillidae. The genus is widespread, occurring across most of the world, except the driest deserts, rainforests and the mainland of Antarctica. They are slender, often drab, ground-feeding insectivores of open country. Like their relatives in the family, the pipits are monogamous and territorial. Pipits are ground nesters, laying up to six speckled eggs. The genus has more than forty species, making it the largest genus in terms of numbers in its family. The exact species limits of the genus are still a matter of some debate, with some checklists recognising only 34 species. 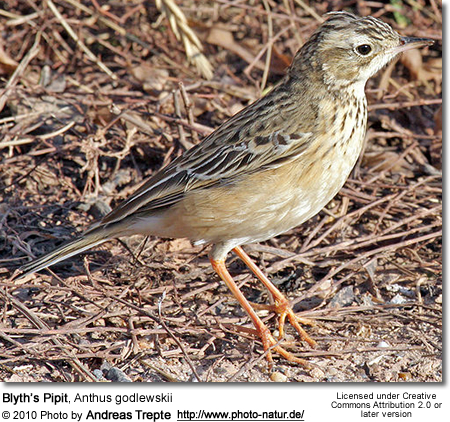 For example, the Australasian Pipit, Anthus novaeseelandiae, which is currently treated as nine subspecies found in New Zealand, Australia and New Guinea, once also included the Richard's Pipit and Paddyfield Pipit of Asia, and the African Pipit of Africa. In addition it has been suggested that the Australian and New Zealand populations be split, or even that New Zealand's subspecies found on its outlying Subantarctic Islands be split from the mainland species. In part the taxonomic difficulties arise due to the extreme similarities in appearance across the genus. 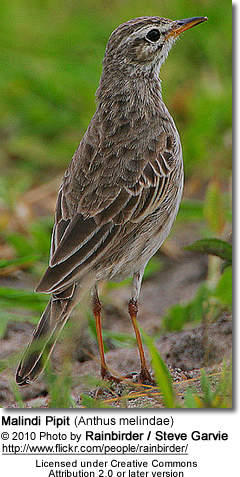 Two species have been identified comparatively recently in South Africa, the Long-tailed Pipit in 1996 and the Kimberley Pipit in 2002. Within the family there is an additional species, the Golden Pipit, Tmetothylacus tennelus, which belongs to a distinct, monotypic genus. 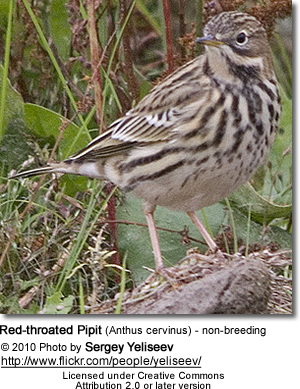 This species is apparently intermediate in appearance between the pipits and the longclaws, and is probably more closely related to the longclaws. One species of pipit, the Yellow-breasted Pipit, is sometimes split out into a genus Hemimacronyx, which is considered to be intermediate between the longclaws and pipits. The split was originally proposed based on morphological features but it has also found support based upon genetic analysis. 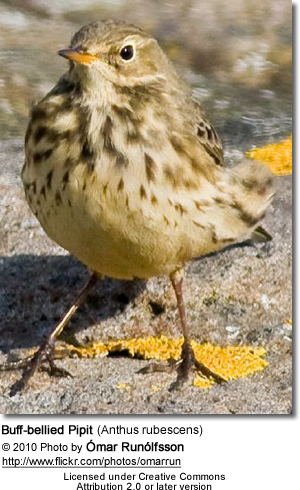 Molecular studies of the pipits suggest that the genus arose in East Asia around seven million years ago (mya), during the Miocene, and that the genus had spread to the Americas, Africa and Europe between 5 and 6 mya. Speciation rates were high during the Pliocene (5.3 to 2.6 mya ) but have slowed down so during the Pleistocene. Repeated dispersal between continents seems to have been important in generating new species in Eurasia, Africa and North America, rather than species arising by radiation once a continent was reached. In South America, however, vicariance appears to have played an important role in speciation. The pipits are generally highly conservative in appearance. They are generally between 16–21 cm (6.3–8.3 in) in length, although the smallest species, the Short-tailed Pipit, is only 11.5–12.5 cm (4.5–4.9 in). In weight they range from 15–38 g (0.53–1.3 oz). Like all members of the family they are slender, short necked birds with long tails, long slender legs with elongated (in some cases very elongated) hind claws. The length of the hindclaw varies with the habits of the species, more arboreal species have shorter, more curved hindclaws than the more terrestrial species. The bills are generally long, slender and pointed. In both size and plumage there is little differences between the sexes. One unusual feature of the pipits, which they share in common with the rest of their family but not the rest of the passerines, is that the tertials (flight feathers) on the wing entirely cover the primary flight feathers. This is thought to be a feature to protect the primaries (longest wing feathers), which are important to flight, from the sun, which causes the feathers to fade and become brittle if not protected. The plumage of the pipits is similar to that of the larks, being generally drab and brown, buff or faded white. The undersides are usually darker than the top, and there is a variable amount of barring and streaking on the back, wings and breast. The drab mottled brown colours provide some camouflage against the soil and stones they are generally found on. A few species have slightly more colourful breeding plumages, for example the Rosy Pipit has greenish edges on the wing feathers. The Yellow-breasted Pipit, if it is retained in this genus, is quite atypical in having bright yellow plumage on the throat breast and belly. The pipits have a cosmopolitan distribution, occurring across most of the world's land surface. They are the only genus in their family to occur widely in the Americas (two species of wagtail marginally occur in Alaska as well). Three species of Pipit occur in North America (one, like the wagtails, only just occurs here), and seven species occur in South America. The remaining species are spread throughout Eurasia, Africa and Australia, along with two species restricted to islands in the Atlantic. Some six species occur on more than one continent. As might be expected from a genus with such a wide distribution, the pipits are found in an equally wide range of habitats. They occur in most types of open habitat, although they are absent from the very driest deserts. They are mostly associated with some kind of grassland, from sea-level to alpine grasslands. The Rock Pipit and South Georgia Pipit can be found in the rocks and cliffs of the seashore, whereas a number of species are restricted (for part of the year in some cases) to alpine areas. The family also ranges from the northern tundra and the subantarctic islands of New Zealand and the South Georgia group to the tropics. They are absent from tropical rainforests, but a few species are associated with open woodland, for example the Wood Pipit of southern Africa which is found in open woodland savanna and miombo woodland. The pipits range from entirely sedentary to entirely migratory. 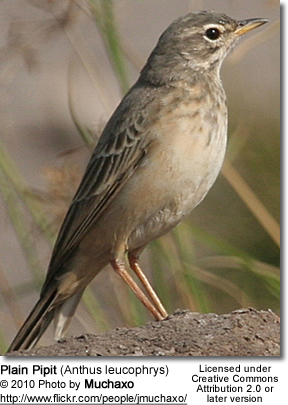 Insular species like the Berthelot's Pipit, which is endemic to Madeira and the Canary Islands, are entirely sedentary, as are some species in warmer areas like the Nilgiri Pipit. Other species are partly nomadic during the non-breeding season, like the Long-legged Pipit of central Africa or the Ochre-breasted Pipit of South America. These seasonal movements are in response to conditions in the environment, and are poorly understood and unpredictable. Longer, more regular migrations between discrete breeding and wintering grounds are undertaken by several species. The Tree Pipit which breeds in Europe and northern Asia, winters in Asia and sub-Saharan Africa, a pattern of long-distance migration shared with other northerly species. Species may also be partly migratory, with northern populations being migratory but more temperate populations being resident (like the Meadow Pipit in Europe). The distances involved do not have to be that long; the Mountain Pipit of southern Africa breeds in the Drakensberg of South Africa and migrates north only as far as Angola and Zambia. Migration is usually undertaken in groups, and may happen both during the day and at night. 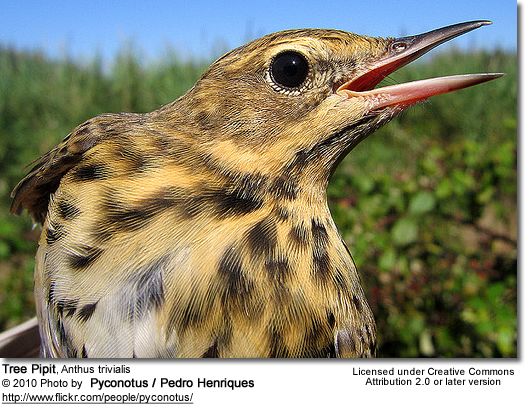 There is some variation in this, for example the Sprague's Pipit of North America apparently only migrates by day. The pipits are active terrestrial birds that usually spend most of their time on the ground. They will fly in order to display during breeding, while migrating and dispersing, and also when flushed by danger. A few species make use of trees, perching in them and flying to them when disturbed. Low shrubs, rocks and termite nests may also be used as vantage points. Like their relatives the wagtails, pipits engage in tail-wagging. The way in which a pipit does this can provide clues to its identity in otherwise similar looking species. Upland Pipits, for example, flick their tails quite quickly, as opposed to Olive-backed Pipits which wag their tails more gently.In general pipits move their tails quite slowly. The Buff-bellied Pipit wags its tail both up and down and from side to side. The exact function of tail-wagging is unclear; in the related wagtails it is thought to be a signal to predators of vigilance. 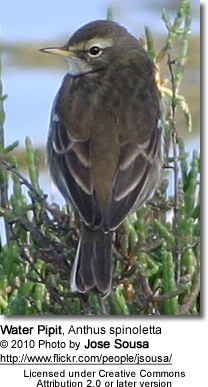 The diet of the pipits is dominated by small invertebrates. Insects are the most important prey items; among the types taken include flies and their larvae, beetles, grasshoppers and crickets, true bugs, mantids, ants, aphids and particularly the larvae and adults of moths and butterflies. Outside of insects other invertebrates taken include spiders and, rarely, worms and scorpions. They are generally catholic in their diet, the composition of their diet apparently reflecting the abundance of their prey in the location (and varying with the season). The diet consumed by adults may vary to that of the young birds; for example adult Tree Pipits take large numbers of beetles but do not feed many to their chicks. Species feeding on the seashore are reported to feed on marine crustaceans and mollusks. A few species have been reported to feed on small fish, beating them in the manner of a kingfisher having caught them. A few species also are reported as consuming berries and seeds.